Grow your millinery creativity by developing hat making skills through Hat Academy online tutorials. Your lessons from Hat Academy will have listed the blocks you will need for your course completion, and they are displayed below, along with a product code for each item. To order the particular blocks you require, simply go to our website order form, and fill out the details of your order (including head size where necessary) with the appropriate product codes and names. You will be contacted shortly afterwards by email, with a Paypal generated invoice. Please be sure to also read our terms and conditions. Australian dollar prices include 10% GST. International customers do not pay GST, and converted prices take this into account. There are no shipping charges, but please be aware that there may be taxes and customs duties payable at your end. We hope you also take the time to look at the many other products in our catalogue for future use if you so desire. 1703 - Crown block spinner Free! View the Hat Academy Millinery Essentials course here. View the Hat Academy Percher course here. View the Hat Academy Blocked Crowns course here. View the Hat Academy Leather Millinery course here. View the Hat Academy Thermoplastic Millinery course, taught by Carole Maher here. 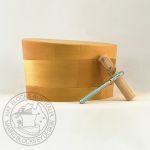 Hat Blocks Australia has a wide range of other Accessories that you may also find useful for your course.